As warmer weather approaches, I've been trying to find more ways to incorporate spring colors and trends into my wardrobe. In the past, I have never gravitated towards statement shoes, typically opting for a good neutral that I can wear time and time again. 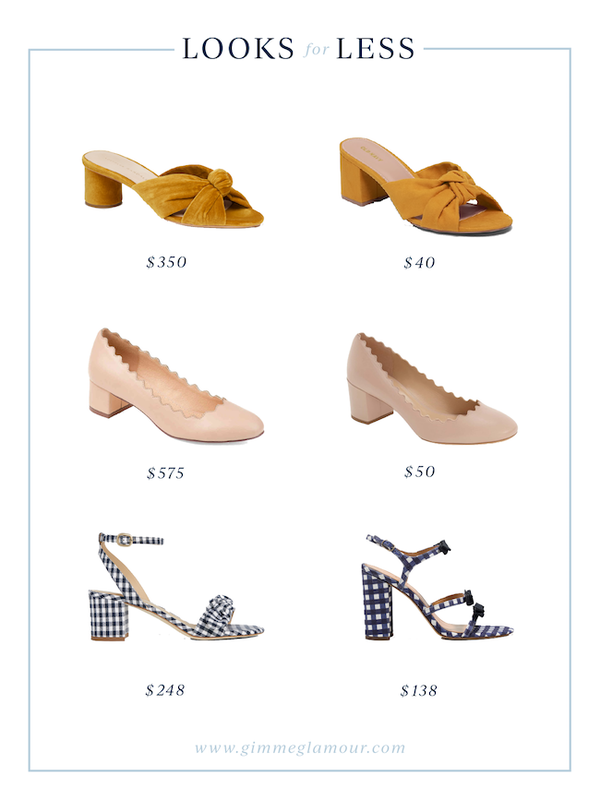 Lately, however I've been obsessing over fun shoes from brands like Loeffler Randall and J. Crew — but not ready to splurge on a shoe that isn't quite an everyday staple. But lucky for us, there are some great look-alike shoe styles for a fraction of the price! I have been in love with Loeffler Randall's Knotted Sandal for quite some time now and they are constantly releasing new colors and patterns. This yellow color is everywhere this spring — even at Old Navy where you can snag a pair of nearly identical block heel mules for $40! I think this sandal would dress up a pair of jeans and look so effortless with a sundress. I just ordered a pair in red and can't wait to style them! Old Navy is currently offering 40% off everything making this pair only $24! I am so glad scallops are a trend that hasn't faded over the years, making a neutral scalloped pump like this one from Chloé a timeless staple. I think the scallops are such a great way to add a fun element to a business casual look or a more formal look, and you can do so for 10% of the price with this pair from DSW! DSW is offering 20% off through Tuesday 3/19 making this pair only $40! When Draper James announced their collection with M. Gemi I was absolutely thrilled to see this gingham pair included. Gingham is everywhere again this season and this pair of heels would be such a fun way to dress up the gingham trend (how fun would gingham on gingham be)! I was surprised to see how expensive they were and found these look-alike heels from J. Crew Factory. While the list price is still above $100, J. Crew Factory always has some sort of sale going on that will bring the price down. Right now, the shoes are listed at 20% off and J. Crew Factory is offering an extra 30% off making this gingham pair $75! What do you think of switching up your look this spring with statement shoes?